Cloudy with periods of light rain. High near 65F. Winds NNW at 10 to 20 mph. Chance of rain 80%..
David Penton, Kossuth County Emergency Management, center, and Kossuth County Sheriff Deputy Jake Radmaker, far right, rescue Tom Fitzpatrick and his 10-year-old granddaughter, who were stranded on the East Fork of the Des Moines River Wednesday. 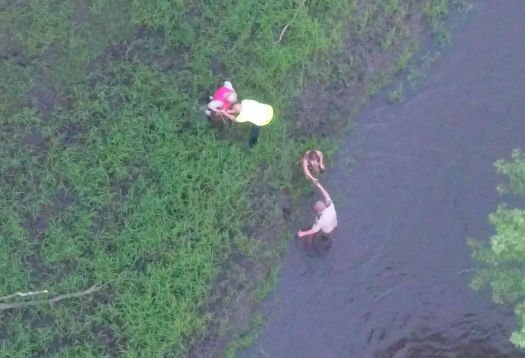 The sheriff’s office used a drone to find the girl and Fitzpatrick, who is now in good condition after having a heart attack. 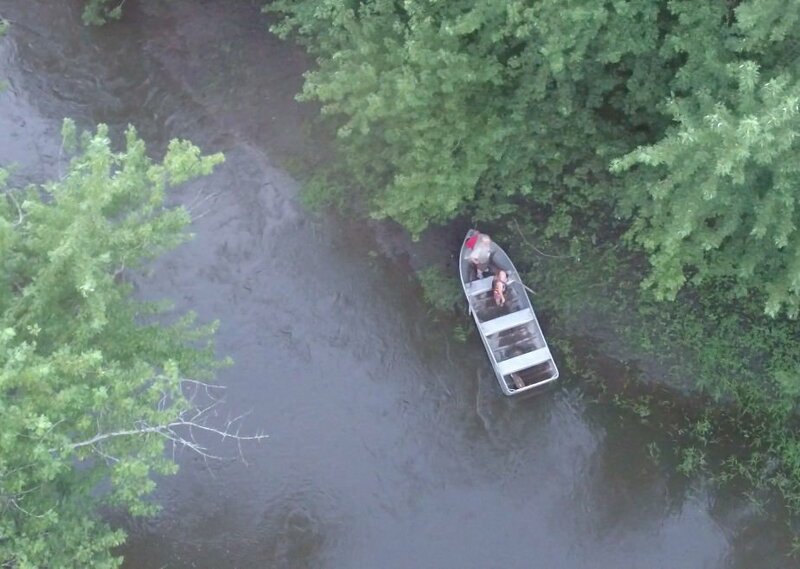 The Kossuth County Sheriff’s Office used a drone to find Tom Fitzpatrick and his 10-year-old granddaughter, who were stranded on the East Fork of the Des Moines River Wednesday. David Penton, Kossuth County Emergency Management, and Kossuth County Sheriff Deputy Jake Radmaker, left, rescue Tom Fitzpatrick, center, and his 10-year-old granddaughter. ALGONA — An Algona man and his 10-year-old granddaughter were rescued from the Des Moines River north of Algona Wednesday night after a drone was used to locate the stranded boaters. The boater, Thomas Fitzpatrick, a former Kossuth County sheriff’s deputy, and his granddaughter had been dropped off at the Plum Creek Dam north of Algona about 5:30 p.m. and were to meet family members at the Veterans Park boat ramp a few hours later. The family contacted the Algona Police Department at 10:22 p.m. The stranded boaters had encountered a logjam and were not sure where they were. The Algona Fire Department deployed its rescue boat to Veterans Park to search the banks heading north and deployed its all-terrain vehicle at the Plum Creek Dam to search south. Also responding were the Kossuth County Sheriff’s Department, Emergency Management, the Emergency Response Team and the Algona Police Department. A sheriff’s deputy was able to contact Fitzpatrick by cell phone and drove along River Road, triggering his siren until Fitzpatrick indicated he could hear the siren. While this was happening, another deputy deployed a DJI Phantom 4 Drone which had just been purchased by the sheriff’s office in May. Once the drone was in the air, it took only 3½ minutes to find the stranded boaters. Fitzpatrick told them he was short of breath and having chest pains. Algona firefighters helped carry him to where a truck could pick them up. Officials said it took nearly an hour to get Fitzpatrick to a waiting ambulance because of the terrain and because the sun had gone down, leaving the area in darkness. Algona EMS transported Fitzpatrick to Kossuth Regional Health Center where a waiting air-med helicopter flew him to Mercy Medical Center-North Iowa in Mason City. He was reported in critical condition Thursday afternoon. His granddaughter was treated and released from the hospital in Algona. Family members asked that she not be identified. Penton said the drone played a key part in the rescue. ALGONA — A North Iowa man remained hospitalized Friday after being rescued from a river near Algona earlier this week. OSAGE | Mitchell County Emergency Services purchased a drone this month for the county’s emergency responders to use. WATERLOO | A Cedar Falls man and his teenage son are home safe after they became lost while fishing and spent the night in George Wyth State Park.